Welcome back tooooo Baby Nyummies!!! Yes yes, we’ve been on hiatus for quite a while haven’t we? The chef gave up on cooking for a while but decided that she needs to make a come back, so here we are! Brand new season of Baby Nyummies, it’s toddler season! Now that the little Chempedak is pretty much eating off Mommy and Daddy’s plates (and anyone elses that she can get her tiny little hands on), it’s time to venture into something more delicious with appealing taste. None of that pureed, blended and mashed stuff, she wants nothing to do with them. 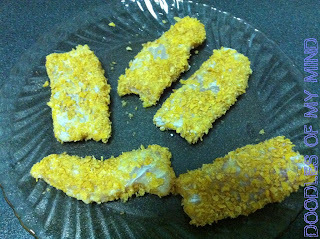 A few days back, I braved myself into the kitchen, rolled up my sleeves and made her.. jeng jeng jeeengg.. Corny Doodle Fish Fingers!! Previously I tried to give her those instant frozen fish fingers, but she didn’t like them. I think the batter was too thick and too hard, she rejected them after the first try. So, this time, I made them from scratch. 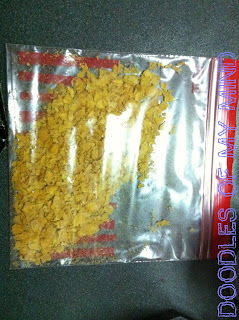 First, pour your cornflakes into a zip-lock bag and crush them over with a rolling pin. If you’re lazy (like me), just roll them over with your jar of tartar sauce. Careful not to crush them into dust though! 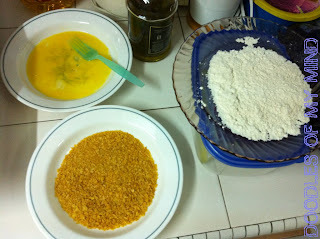 Once you’re done crushing, put your cornflakes, egg and flour into individual plates and set aside. 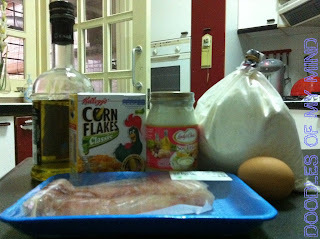 Egg, cornflakes and flour ready! 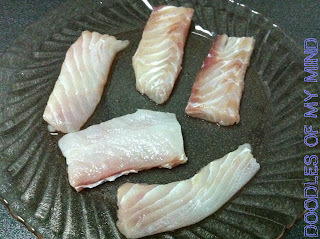 Next, wash your fillet of fish and cut it into several toddler-friendly strips. Mine was cut into the size of about two fingers each.If you want, you can season them with a bit of salt and pepper. I left mine as is. Floured, egged and flaked! FEF! Heat up the oil in a non-stick pan and sauté the fish for 2 to 3 minutes (or until golden). Don’t forget to turn your fish every now and then to ensure that they’re cooked evenly. Optional : I wanted to serve potato wedges with my fish fingers. So what I did was, before I started crushing the corn flakes, I cut a potato into several wedges and boiled them for a bit. After coating my fish with FEF, I turned off the fire, drained the potatoes and put them aside. 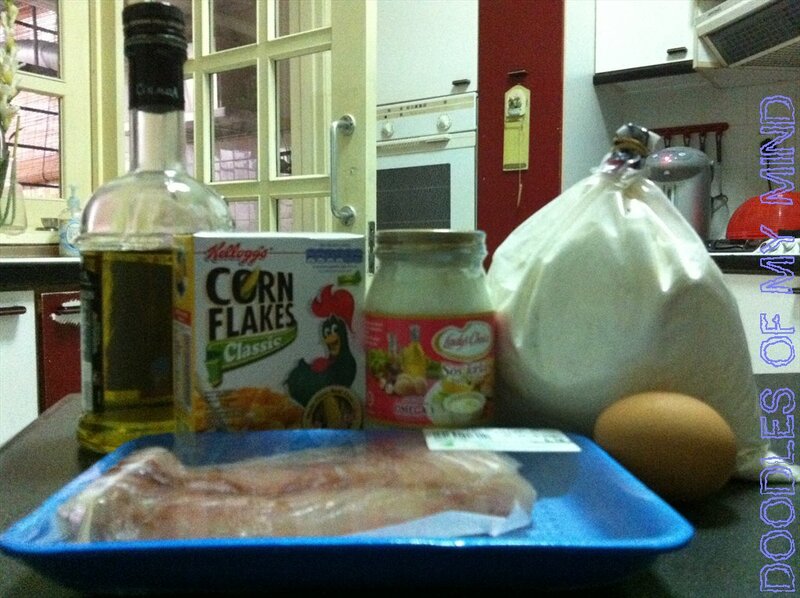 I then continued cooking my fish. 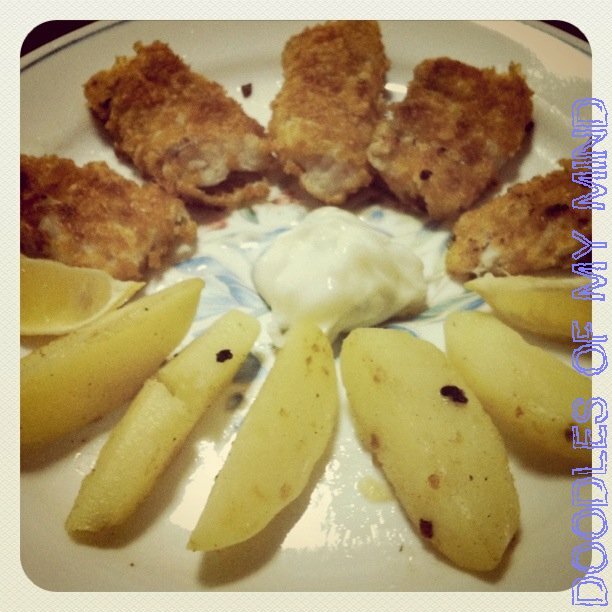 Once I was done with my fish, I lightly fried my potatoes in whatever oil that was left behind. E'n1x & Anita : this one I love too! I sendiri enjoy! hahahhah!